A distinguished work by one of America's leading scholars of higher education, Places of Inquiry explores one of the major issues in university education today: the relationship among research, teaching, and study. 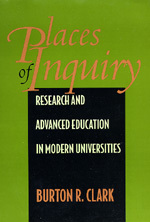 Based on cross-national research on the university systems of Germany, Britain, France, the United States, and Japan—which was first reported in the edited volume The Research Foundations of Graduate Education (California, 1993)—this book offers in-depth comparative analysis and draws provocative conclusions about the future of the research-teaching-study nexus. With characteristic clarity and vision, Burton R. Clark identifies the main features and limitations of each national system: governmental and industrial dominance in Japan, for example, and England's collegiate form of university. He examines the forces drawing research, teaching, and study apart and those binding them together. Highlighting the fruitful integration of teaching and research in the American graduate school, Clark decries the widely held view that these are antithetical activities. Rather, he demonstrates that research provides a rich basis for instruction and learning. Universities, he maintains, are places of inquiry, and the future lies with institutions firmly grounded in this belief. Burton R. Clark, Allan M. Carter Professor Emeritus of Higher Education and Sociology at the University of California, Los Angeles, is coeditor of Encyclopedia of Higher Education (1992) and author of The Academic Life: Small Worlds, Different Worlds (1987), which won the American Educational Research Association's Outstanding Book Award.